How Africa's Oldest National Park Can Benefit Both Gorillas And Locals : Goats and Soda Virunga, a new documentary on the Congolese park, premieres Friday on Netflix. We spoke to the chief warden about endangered mountain gorillas, oil speculators and the power of tourism. Despite recent gains, Virunga's endangered mountain gorilla population is still under threat from poaching. Chief warden Emmanuel de Merode calls Virunga "the greatest park on Earth" for its remarkable diversity, including rare mountain gorillas. In a new documentary, Virunga, mountain gorilla orphans play with their handler in a nondescript concrete building in a Congolese national park. They jump. They tackle each other. They hug. They play pranks. When the gorillas are onscreen, the film, by British director Orlando von Einsiedel, is absolutely charming. But they're just one part of a complicated story encompassing everything from the fate of these animals (only about 800 remain in the world) to the best way that Virunga National Park can benefit the people of the Democratic Republic of Congo (DRC). As always, there are opposing interests and forces, ranging from conservation to oil drilling and tourism. 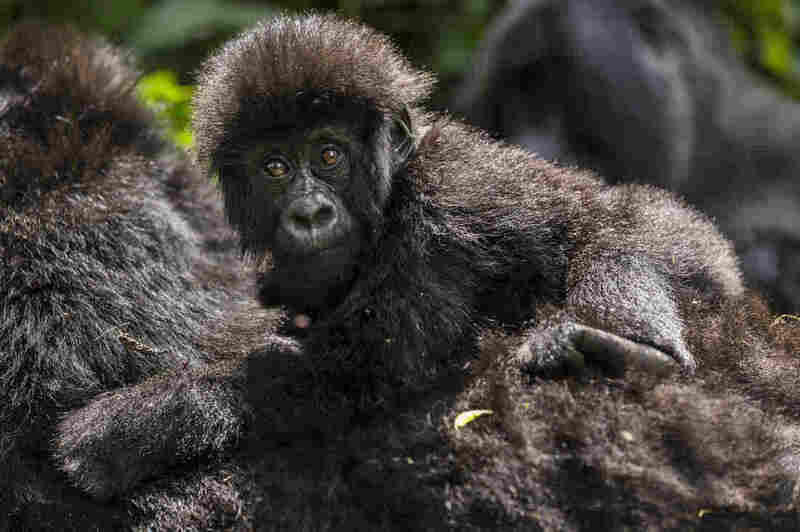 Under constant threat of poaching, the gorillas themselves teeter on the brink of extinction. While results of a 2010 census offered hope — 480 mountain gorillas were estimated to be living within the park, and conservation efforts had contributed to a 3.7 percent annual growth of the species — the film clearly shows that Virunga's mountain gorilla population is not in the clear. And neither is Virunga. It's Africa's first national park and has been a UNESCO World Heritage Site since 1979 because of its remarkable diversity, including the highest concentration of mammals in the world. It boasts 50 percent of all the terrestrial species in Africa and a topography that includes lowlands, wetland savannahs, tropical rainforests and volcanoes. But since 1994, the 2 million-acre park has suffered. Aside from the wildlife poaching, 140 park rangers have been killed either by militants or poachers. Virunga borders major communities; a 20-year civil war has claimed more than 5 million Congolese lives and made the dense forests a hiding place for militias while also serving as a refuge for fleeing citizens. Its foliage has made it a convenient base camp for the Congolese Revolutionary Army's M23 rebel fighters, and an escape for armed groups from neighboring Rwanda. Meanwhile, a British petroleum company has begun to explore the park. Many locals believe oil money will enrich their day-to-day lives, but environmentalists argue that drilling would lead to the destruction of this African paradise. Virunga's staunchest defender, a key figure in the documentary, is the park's chief warden, Emmanuel de Merode, 44. He's a Belgian prince who has lived his entire life in Africa and is the only foreign national to serve in the Congolese government. For de Merode, protecting Virunga is personal: He's run the park for six years, studied it as an academic and risked his life for it. In April, unidentified gunmen ambushed him on a road outside the park and shot him multiple times in the chest and abdomen. Local residents and emergency surgery saved his life. By May, he was back on the job. While de Merode doesn't like to discuss the shooting, he is eager to speak about the importance of sustainable development — which he defines as using natural resources in a safe, productive way that benefits both wildlife and the community. "We have 2 million acres of land set aside for conservation because it is important for humanity," de Merode said by phone from New York, where he has been promoting the film. "With local communities, we can create 100,000 jobs in the next five to eight years. There's no way the oil sector can achieve that. Sustainable development can." The park, aided by foreign investment organizations, has taken small steps toward encouraging development in surrounding communities, focusing heavily on small hydroelectric plants that draw on rivers in and around the park to provide power and jobs without negatively affecting the pristine environment. A plant created last year "is community-based, off-grid and serves the community with 400 kilowatts, [the equivalent of] 40,000 light bulbs — enough to supply one block of New York for a year," de Merode says. Although a relatively small project, "It has transformed a community and encouraged investment," he says. Meanwhile, "A German company has finished construction for a soap factory with 400 jobs, driving up the price of palm oil for 100,000 farmers around town ... All of the profits are retained in Congo." That isn't the case, de Merode contends, where the British oil company SOCO International is concerned. While successful oil exploration in Virunga would provide trickle-down benefits to surrounding areas, he says, most of the profits would not benefit locals. The Virunga film includes footage shot undercover by French freelance journalist Melanie Gouby, showing SOCO representatives offering bribes to park officials, making racist remarks about the Congolese ability to manage the park ("We should re-colonize these colonies, they act like children, they're not mature," says one SOCO employee) and proposing how SOCO could overtake de Merode's park ranger unit to drill within park boundaries, a violation of international law due to Virunga's World Heritage status. "There's an alternative to this form of development," De Merode says, one that wouldn't "[damage] the natural environment." If peace comes to the DRC, Virunga will become an increasingly strong draw for tourism, de Merode suggests, particularly given the adorability of the mountain gorillas. Estimates suggest 3,000 to 6,000 tourists already visit the park annually. He believes that Virunga's natural gifts match, and even beat, those of better known African tourist destinations. Kenya's tourism, de Merode points out, brings in millions. Virunga could, in his opinion, someday make Kenya's tourism revenues pale in comparison. For now, things seem to be taking a turn for the better in Virunga. In June, SOCO struck a deal mediated by the World Wildlife Fund to stop drilling unless "UNESCO and the DRC government agree that such activities are not incompatible with [the park's] world heritage status." But this doesn't mean de Merode is resting. If anything, he is fighting more tirelessly than ever. These days, he is vigorously promoting the park's conservation efforts as part of the documentary's publicity tour, along with the gorilla caretaker featured in the film. 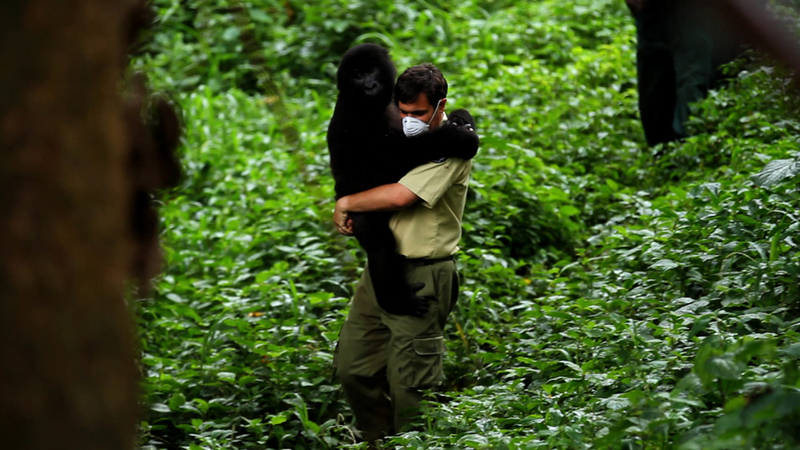 He hopes Virunga — warmly received by critics, funded by philanthropist Howard G. Buffett and featuring Leonardo di Caprio as executive producer — will encourage audiences to see that what happens in the park as an issue with consequences far beyond the DRC's borders. Should things in Virunga deteriorate, "I'm genuinely concerned about the ramifications across the world," de Merode said. "If we don't do anything, what's happening in Virunga is something we will deeply regret, that our children will deeply regret. That would be the destruction of the greatest park on Earth." Virunga premieres Friday, Nov. 7, on Netflix.